This trade route was made possible by the understanding of monsoons in their seasons and alternating wind currents. Winds blew eastward during the summer months and westward during the winter. By using this knowledge along with the growing technology of navigation systems, merchants could use natural energy to transport their shipments. 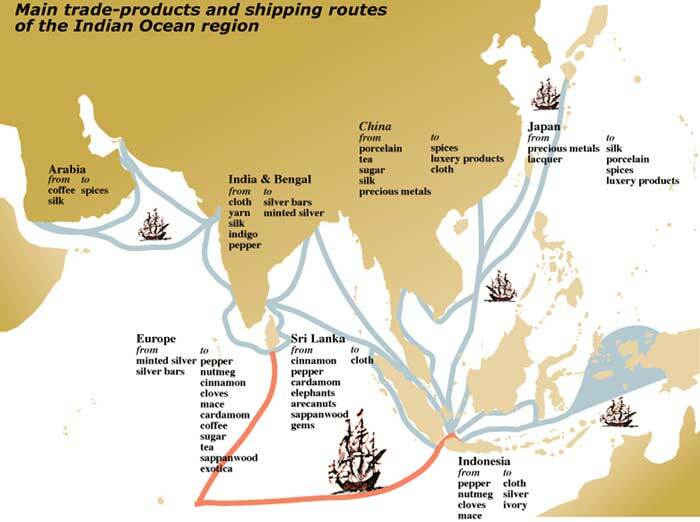 LIke the Silk Road, this trade system did not involve entire empires but rather urban areas along the coast of many regions as seen in the graph. These urban towns created a change of hands between the coastal cities and the great metropolis areas that were located deeper in the region. Also, through this method, merchants often had more in common with one another then the people of their origins. Through these connections, trade was increased becasue merchants more or less became common friends rather then enemies of their empires. Very little is known about the America Trade system due to lack of written text, however we do know the major players within the trade routes. The Incas and Aztecs led the biggest trade routes due to their overall power within their regions. They relied heavly on taxing their conquested territories which allowed them to take greater control of the various regions within the trade systems. Among the Aztecs, special merchants called pochtecas, undertook the task of large-scale trading expeditions aross many civilizations in the Americas. However, the Incas practiced accounting were indiviuals recorded amounts in ledgers called quipus. Either way, both civilizations' practice of commercial techniques aloud them to spread their culture, ideals, and diseases common to their area to more regions within the Americas. The American trade route was more disperse rather than set roads like in the Silk Road, so influences were far and few between in the Americas. Sources. Boston: Bedford/St Martin's, 2010. Print.